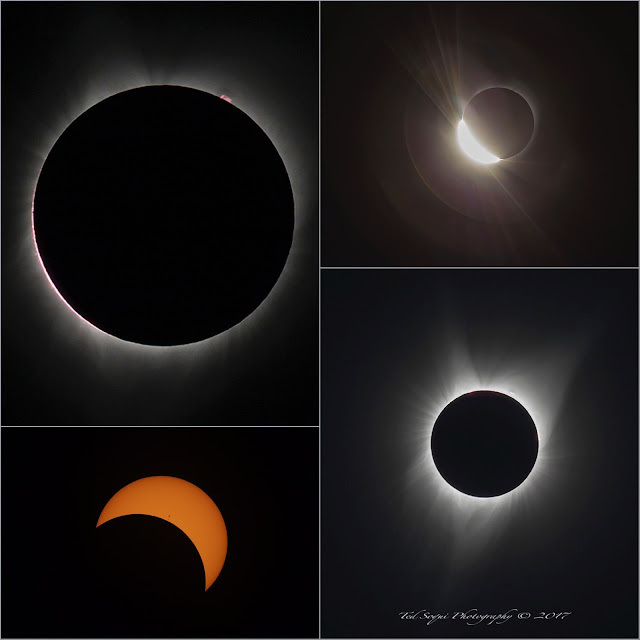 Four months ago I started to seriously plan for photographing the Great American Solar Eclipse. I wanted to be one of the first terrestrial Americans to see the amazing event, so Oregon would be the place to be. I downloaded several maps and searched the line of totality for any points of interest that looked interesting. Nothing really stood out except for Mt. Jefferson, a giant strato volcano. Next I used the photographer's ephemeris to search where, when, how high the sun would be during totality. I found a point deep in the Willamette Forest accessible by a tiny fire road and 4 mile hike. That would be the spot for me. 2 weeks before E-day a giant forest fire took over much of the Mt. Jefferson area filling it with smoke and fire. The forest service shut off all access to the area. There went all my planning up in smoke. Plan B was to be somewhere on the Oregon coast. Searching through weather reports for the last 4 years showed in August cloud cover would be highly likely. Recent future weather reposts gave the coastal city Lincoln City a 50/50 chance of cloud cover. Many eclipse chasers would make plans to avoid the area and head to the desert area town of Madras instead. 50/50 seemed like good odds to me, way better than any Vegas odds for sure. I landed in Portland a day before, every flight was completely full, and the airport was at capacity. I had fears that my car reservation would be cancelled or not honored after hearing news reports of Hertz Rent a Car cancelling reservations and re-booking at astronomical rates. Rental rates a week before started at $1000 per day, if you could get one. Things started to look up at the Enterprise Car Rental booth. The company planned for the eclipse surge by adding more cars and workers. They had my booking and even upgraded me to a new Dodge Ram 4x4 SLT with a 400 hp Hemi engine, 8 speed transmission, and a full tank of gas. I drove down to to coast on E-day via the 5 freeway early in the morning, traffic was light due to everyone was heading to eastern Oregon and the city of Madras to avoid any cloud cover. I saw the night sky was clear with stars, so far my luck was good. Got down to the coast line and started to see a bit of fog hugging the coast. I didn't unpack and set up incase I needed to move and find a cloudless sky. Figured being on the actual coast would be too risky and drove inland about a mile where it was all crystal clear blue Oregon sky. There was a beautiful empty field where I used the 4x4 to drive on to and set up with 30 mins to set up. The good thing is that I have been drilling setting up quickly months before hand. The eclipse started slowly. Over the next hour the temperature would drop by at least 15-20 degrees as the sky grew darker. It also became quieter. Five minutes before the eclipse I checked battery and memory card capacity. All was good. The solar filter I made was working well and I began to loosen it for removal during totality. With all of the preparation, including several books read, photos studied, videos watched, nothing can really prepare you for totality. It is very different and difficult to fully describe how truly amazing it is. Finally, a round black disk that was the Moon moved very slowly in front of the Sun, completely blocking out the Sun and turning day in to night. It was epic. I removed my solar filter and began to shoot totality for the next 2 minutes. Here are the results. It was a Great American Eclipse.